Thailand is littoral country with the coastal zone including the Gulf of Thailand Coast and the Andaman sea Coast. They are economic important areas where 23 provinces are located with approximately 12 millions of population living in the areas. The coastal are characterized by geologic nature of landforms as sandy beach and dunes, coastal wetland, rocky coast, cliff coast and islands. These areas were formerly rich with natural resources both living and non-living, and less spoiled nature. During the last two decades, and over exploitation of resources, population growth, intensified developments on tourism, aquaculture, and industries caused evidences of environmental degradation in resources of the areas that lead to coastal problem. In the view of geo-environment, coastal problem includes beach pollution, coastal erosion, reduction of coastal wetland, and reduction in sedimentary supply. These problems point to increasingly polluted coastal environment caused by natural processes and human activities. These coupled activities are also consider as factor of global warming, resulting in sea-level rise. However, there are huge uncertainties still remain over the magnitude and rate of sea-level rise, which usually based on the regional scale studies, trough tectonic and geologic processes are difference in each coastal zone. Coastal problems in Thailand could be solved by appropriate technologies and management approaches. The main cause of failure in achieving the solution to solve coastal problem in Thailand is an overlapping responsibilities among the relevant government agencies. This conflict, leaded the government of Thailand has established a national committee. "Thai Marine Policy and Restoration Committee� which has classified the work into 9 categories. Of which, the context of non-living resources is under the responsibilities of the Department of Mineral Resources and representative from relevant government agencies. The responsibilities are to study, prepared the policy and measure to develop the coastal area and environment degradation. Thailand is a littoral country with total coastal length of about 2,815 km. including Andaman Sea coast 937 km. and Gulf of Thailand coast 1,878 km. The Gulf of Thailand coast usually classified into Eastern coast, upper Gulf and Western Gulf of Thailand coast, based on their geographic location. In the view of tectonic setting of Southeast Asia, the coastal area of Thailand is a geologically stable region, the so-called Sundaland, where it has only the experience of very slow vertical crustal movement. Faults are the main geological structure that related to the coastal zone and they are believed to be tentatively active. The first is Three Pagoda fault trending NW-SE direction, and extending from western mountain range of Thai-Burmese border to the Western Gulf of Thailand coast. Ranong and Khlong Marui fault zone are the other two tentatively active faults trending NE-SW direction, extending from Andaman Sea coast offset the upland of southern Thai peninsula to the Gulf of Thailand coast. These faults are shaping the landform on the upper Gulf of Thailand coast, and southern Thai peninsula. 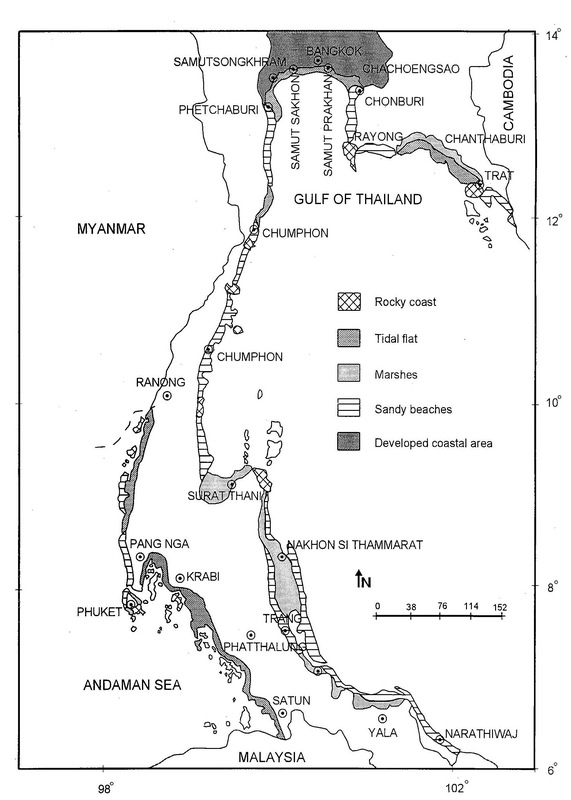 The coastal geomorphology of Thailand characterized by beach sand and dune, coastal wetland (tidal flat and marshes), rocky coast and cliff coast. Andaman Sea Coast is dominated by pocket beach, extensive and well preserved tidal flat vegetated with mangrove forest, cliff coast and numerous islands. The Gulf of Thailand Coast characterized by long and wind mainland beach. Features such as raised beaches with dune, variety of lagoons, tidal flat and marshes were developed. The elevation of coastal areas ranges from 0-4 m. above the mean sea-level with minor undulations. These coastal landforms indicated the invasion of Holocene sea which reached the maximum height at about 6,000 yr. BP. However, there are evidences of Late Pleistocene marine sediment locally found underlie the Holocene sediment in the Gulf of Thailand Coast. The detailed study of this evidence should be clarified in future geologic research. Rocks in the coastal zone range in age from Precambrian to tertiary, including all main rock types. 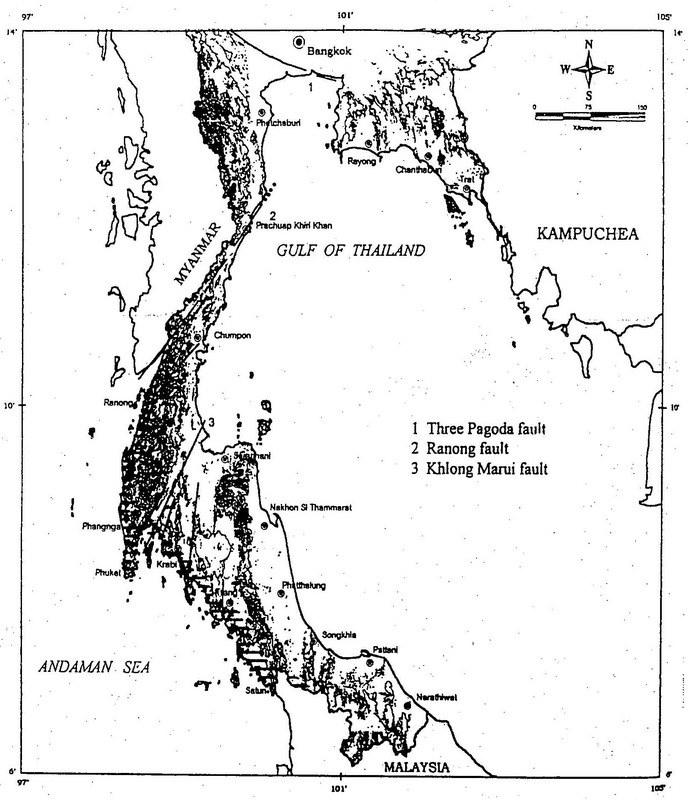 Rocks on the east and west coast of the peninsular are mostly the same units, except the Upper Gulf of Thailand Coast where unconsolidated Quaternary sediments are dominant. The coastal areas of Thailand has tropical climate, that characterized by two monsoonal winds. The southwest monsoon from May through October brings moderate to heavy rains. The southwest winds generate moderate waves along the east coast of the Gulf of Thailand, and mainly generated along the Andaman Sea Coast. The retreat of southwest monsoon in September and October is frequently accompanied by peak wind and wave intensity caused by the passing of cyclones generated in South China Sea. The northeast monsoon, from October to April, the winds generate wave along the east coast of the southern peninsular of Thailand, and the wave along the east coast of Gulf of Thailand very small during this time. Based on geological setting and climate. Thailand is not a serious hazardous country. The coastal problems which growing rapidly in the last two decades were caused by both natural and man included processes, particularly the rush development that affect environment and society at the coast. The different types of problem should be approached in the particular part of the coastal geo-environment, and they are both caused by nature and human activities. Beach sand and dunes. These area are main sites for development in several aspects such as industries, aquaculture, infrastructure, recreation and tourism. Beaches and dunes sediments in Thailand vary in composition from fine sands to gravels size and also vary in their mineral composition. Mining activities for heavy mineral as well as tin were activated in those days but since tin prize collapsed in October 1985, most mines were ceased operation. The most striking example among the coastal problems is the landuse on the beach sand, particularly during the property boom in the early 1990. Most of the beach sand in the core of tourism, tall hotel and condominium buildings are constructed close to the water�s edge, obstructed public access to the beach sand. Moreover, naturally accumulated sand and dunes that once protected the inland area have been removed to improve the view, and road construction along the coastline. Resulting in accelerating erosion, land subsidence and flooding. These problems not only damaged the building and structure, but also lead to confrontation among different groups of interests in local communities. Coastal wetlands. In Thailand, coastal wetlands including tidal, flat support mangrove forest, marshes, and lagoon. Marshes and large lagoons are well developed in Gulf of Thailand Coast, and mangrove forest are well preserved in the Andaman Sea Coast, Phang Nga, Satun, Krabi provinces are the well preserved mangrove forest areas respectively. Wetlands form in low-lying, relatively sheltered area. In general, they are characterized by low wave energy and dominated by tidal processes. The sediments ranging from clay and silt to fine sand, Shell fragments, peat and decomposed plant are intercalated. The major problem of wetland is landuse where they were converted into prawn farms. This activity accelerated the coastal erosion, it caused salt water intrusion to the adjacent rice field and seepage of salt penetrate into coastal aquifer. Moreover, some waste water are drained into the sea, affecting the sea water quality and biodiversity in the nearshore. Another example of problem in wetland area is failed up land and drained for infrastructure and agricultural production needs. This leads to the land subsiding, flooding, and fire in summer. However, some wetland areas in Thailand have achieved important conservation status because they act as coastal protection and purification, temporary resting and feeding stations for migrating birds and other animals. Rocky coast and cliff. Rocky coasts in Thailand comprise a wide range of forms, and composition of rocks. Cliff are occur as headlands between bay (pocket beach), and also lines at the back of expanse beach. Usually, landuse in rocky coast are roads and resorts construction which must be protected from rockfalls. Strong wave action that eroded the rocks is the main problems, particularly rock in the conservation areas and marine national parks. A good example is in Ban Laem Pho, Krabi province, where Tertiary fossils beds are severely eroded by strong wave action. DMR conducted a project in order to protect and stabilize the fossil beds which is one of the most important geologic records of the country. Recently, the project cannot be implemented due to different views on design of protection structure. Natural hazard. It is also important component of coastal problem in Thailand, such as tropical cyclone. Forty eight years of record on tropical cyclone indicated that October and September is the period of tropical cyclone generates and reaches Thailand coast. Tropical storm frequency in Thailand is about 3-4 storms per year. Usually, tropical storm caused heavy rainfall, flash flooding and storm surges. Historical records of tropical storm that ravaged the coastal area of Thailand have been killed people and eroded the coastal zone. The time of southwest monsoon is the time of tropical cyclone ravaged in the coastal areas of Thailand. Usually, it effected the east coast of southern peninsula. Global warming and sea-level rise. Geological research in Thailand has experienced on sea-level change since 10,000 years, as a consequence of changing cover of ice at the end of the last glaciations. Recently, there has been considered that human activities combined with natural fluctuations will create a rising global sea-level. For example man induced subsidence caused relatively sea �level rise by over pumping of ground water in Bangkok area. In order to investigate the nature and causes of sea-level change in Thailand. It is necessary to have a good series of measurement. There are huge uncertainty still remain over the magnitude and rate of sea-level rise in Thailand. Most of current data come from inadequate tidal gauge records, as well as regional and global data of interorganization research that is questionable through tectonic and geologic processes are difference in each coastal zone.